GD is key to MBA admission 2018 in FMS, XLRI, MDI & other top MBA colleges. It commands 10 to 15 percent weightage in MBA admission in top MBA colleges. GD Topics: It is necessary to have good knowledge about the latest GD topics, to be able to add value on content. MBAUniverse.com has prepared summary of key facts and information needed for Top GD Topics. Read below the solved GD topic and prepare your content based on the information. Opinion based topics may act as a blessing in disguise. Though they lack a structured framework but provide liberty to get creative and proceed in any possible direction. 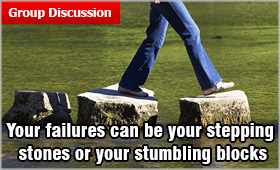 On the same lines we have provided some possible interpretations which can be further extended to help you get hold of the topic “Your failures can be your stepping stones or your stumbling blocks”. Treating Failure: Introduce the Topic well! Failure is when individuals are unable to meet the desirable or intended objective. We ourselves are the only ones who can label what we make out of our failure. Our failure can be our stepping stone if we take it as a chance of self improvement. It is like a trial in an experiment. It depends on our own judgment. Failure can be a delay but not defeat. However, if one loses heart and the willingness to improve then it becomes our stumbling blocks. Failure should be viewed as a process to regress upon the mistakes made and to take a corrective action. Only then we can turn our failure into a stepping stone. Life is like a zero-sums game, one’s loss is other’s gain so failure is a part and parcel of life. One has to learn to move on instead of sticking to it. Edsel “the marketing failure”: Ford invested $400 million in the Edsel car which didn’t find a consumer base as big as envisioned and was ultimately taken off within 2 years of launch in 1960. It cost a fortune to Ford; however the group accepted its failure and capitalized demand for small cars like Mustang, Falcon, Comet which were a huge success. So, Edsel became Ford’s stepping stone for the years that followed. In an attempt to outdo Pepsi in 1985, New Coke tried flavors that would taste like Pepsi which led to a lot of hue and cry from its fans and instead diverted its consumers to Pepsi. The old classic coke returned within a few months of New Coke. It taught the group that it is the loyal customer base that drives growth and not merely similar flavors. One should set parameters of success and failure as what worked for one may not do for others. One needs to use own strengths to deal with failure. J K Rowling’s Harry Potter books were rejected numerous times before they were actually published. Had she given in to the failures, this unemployed, single mother would not have been a millionaire. It is the determination and perseverance hat make our success stories and not lamenting over them. In Bible and in Politics, stumbling block is a metaphor for a behavior or attitude that directs individuals to another sin or to destructive behavior. Those who fail to identify the cause of their failure and respond promptly, lose mental composure are most likely to trigger more unfavorable outcomes. Ego can exhaust one of individuals’ true capabilities as it defers the process of self improvement. One should push through hard times and failure without ego. The fear of failure is the biggest stumbling block as individuals give up on themselves. Suicide is an instance where one quits trying. Having No Goals is the biggest stumbling block as efforts are not channelized in the right direction. Failure teaches us what not to do and can be a stepping stone towards becoming more productive. One should learn to embrace their flaws by taking it as a feedback and not as the ultimate chance. And like Edison said ““No, I did not fail. I discovered 24,999 ways that the storage battery does not work.”, one should be optimistic & constantly make efforts to improve performance as opportunities can arrive at any time and turn our failure into success stories. Keep your ideas on positive side creating a good hope instead of criticizing the past. If you are not well versed with the topic and feel a bit confused on it, try to gather information from first 1-2 speakers and then place your view point. Use the quote and data, if you are sure of the source else leave it.